UUP Councillor Tim Mitchell assesses the damage caused after a number of bins were destroyed by arsonists in the Causeway End Road area of Lisburn. A number of Lisburn residents whose household waste bins were destroyed during a series of arson attacks earlier this week could get replacement bins free of charge, thanks to a goodwill gesture from the council. Around 20 homeowners in the Causeway End Road and Drumard Drive areas of the city saw their bins destroyed by acts of vandalism in the early hours of Wednesday, May 3. Police said that at around 4am they received a report that several bins had been set on fire in the area. Scorch damage was also caused to a Suzuki car that was parked on Causeway End Road as a result. Ahead of Wednesday evening’s meeting of the council’s Environmental Services Committee, several members said they would be calling for Lisburn and Castlereagh City Council to replace the damaged bins free of charge. Speaking ahead of the meeting, DUP Alderman Paul Porter said: “Following the disgraceful burning of 20-22 bins in the Causeway End Road, Rushmore and Drumard area early this morning, James Tinsley, Paul Givan and myself have been working with the PSNI, council and community representatives. 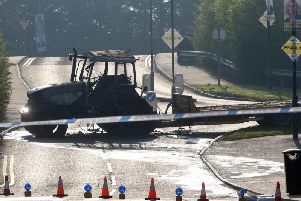 UUP Councillor Tim Mitchell said: “I was alerted early this morning by constituents in the area of these arson attacks. This has been a very upsetting experience, particularly for a number of elderly residents affected by this disgraceful act of criminal damage. Speaking to the Ulster Star on Thursday morning, Alderman Porter confirmed that committee members had agreed unanimously that the council should provide affected householders with replacement bins free of charge, “due to the exceptional circumstances”. However, it’s understood that decision still has to be ratified when the full council meets on May 23. Condemning the arson attacks, Lagan Valley DUP MLA Paul Givan said: “I totally condemn the wanton vandalism caused to properties, vehicles and bins in the Causeway End and Rushmore areas overnight. The trail of destruction left as a result of the actions of a small number of cowardice individuals has caused concern and distress among residents. “Myself and colleagues have engaged with council officers and other statutory agencies regarding this matter to assist in returning the area to normality and the Police are investigating the incident. Mr Butler went on to praise the speed of the response to the incident by both PSNI and Northern Ireland Fire and Rescue Service personnel, and the professional way in which they conducted themselves. Inspector Richard Murray is appealing for anyone who witnessed the incidents or anyone who has any information that can assist with the investigation to contact officers in Lisburn on 101 quoting reference number 135 of 03/05/17. Information can also be passed on anonymously via the independent charity Crimestoppers on 0800 555 111.